The Enferplex Multiplex Platform is the next generation ELISA which allow multiple results from one sample. The platform can support up to 16 individual antigens or antibodies printed discretely in each well and adequately spaced and resolved from one another to allow the high resolution imaging system to see each reaction at each spot as a separate assay. The time, labour and cost savings brought about by this technology are significant. With Enfers’ experience in array printing and assay design, we are confident that we can put together a test for most major diseases of interest in the veterinary field. We can provide such tests as a service, carried out in our accredited testing facility or as a kit, produced in our accredited manufacturing facilities. Image showing an example of a multiplex plate with a 6 spot multi-antigen assay. 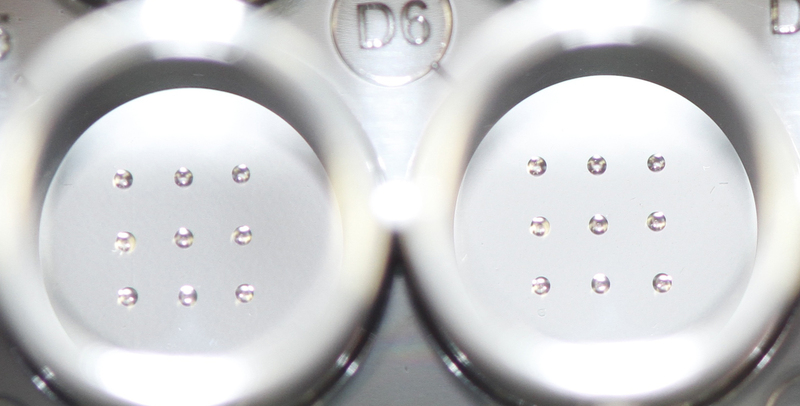 A magnified well is shown of a 6 spot multi-antigen printed well. 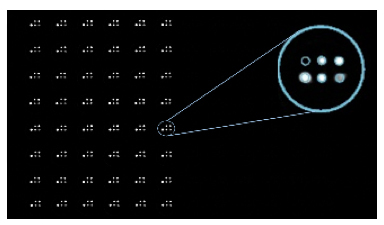 Data is extracted as Relative Light Units (RLU) from each spot for analysis. Example of 9 spot multi-antigen printed wells.